Scarp is a term in geology and geography with several similar meanings. A scarp is a cliff or steep slope. The word is derived from the Italian scarpa, meaning 'shoe'. The surface of the steep slope is called a scarp face. A fault scarp is a steep cliff made by movement along one side of a fault. 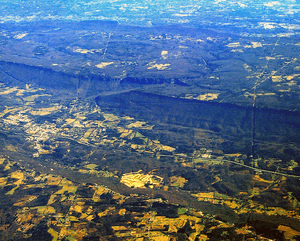 An escarpment is a steep slope or long cliff that occurs from faulting and resulting erosion. It separates two relatively level areas of differt height. A cuesta is a ridge with an escarpment on one side and a gentle dip slope on the other side. vertical movement of the Earth's crust along a geologic fault. Most commonly, an escarpment is a transition from one series of sedimentary rocks to another series of a different age and composition. Escarpments are also frequently formed by faults. When a fault displaces the ground surface so that one side is higher than the other, a fault scarp is created. This brings a piece of high ground next to an area of lower ground. More loosely, the term scarp describes the zone between coastal lowlands and continental plateaus. A marked, abrupt change in height is caused by coastal erosion at the base of the plateau. Scarp (landform) Facts for Kids. Kiddle Encyclopedia.